JUST CHECKING IN TO LET YOU ALL KNOW WE ARE FINE. IT’S BEEN AT LEAST A WEEK SINCE WE POSTED ANYTHING ON THE BLOG AND I DIDN’T WANT ANYONE TO START WORRYING ABOUT US. MARY BANGED HER KNEE AND HASN’T BEEN ABLE TO GET HER MORNING WALKS IN. THIS LACK OF ACTIVITY MAKES FOR A GROWLY MARY, INSTEAD OF A HAPPY CAMPER, SO NO BLOGS. REX STILL HASN’T GOT HIS SCOOTER BACK FROM THE SHOP THAT IS SUPPOSED TO BE CRAFTING NEW STEEL HANDLE BARS. IT’S BEEN WELL OVER A MONTH, AND THESE SUNNY AND 70 DAYS MAKE FOR A GROWLY REX, INSTEAD OF A HAPPY CAMPER, SO NO BLOGS. 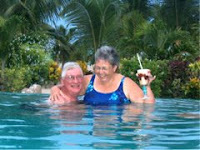 IN A COUPLE OF WEEKS IS SPRING BREAK AND THOSE GRANDSONS AND KIDS ARE SURE TO GET THE BLOG BACK ON TRACK. ON OUR DAYS OFF THIS WEEK WE WENT TO LAKE HAVASU AND THE BIG SUNDAY SWAP MEET. THIS SWAP MEET RUNS EVERY SUNDAY BETWEEN LABOR DAY AND MEMORIAL DAY, BUT HITS THE HIGH DURING SNOWBIRD SEASON IN JANUARY AND FEBRUARY. THE VENDORS BEGIN SELLING AT 8 AM AND ARE PRETTY MUCH DONE AT NOON. I THINK IT’S BEEN SEVERAL YEARS SINCE WE HAVE VISITED. THE CROWDS ARE STILL HUGE, AND YOU CAN BUY NEARLY ANYTHING. LAKE HAVASU CONTINUES TO GROW AND WINTER TRAFFIC IS AT AN ALL TIME HIGH. ON MONDAY WE LAID LOW, AND ENJOYED 76 DEGREES ON THE PORCH. IT’S THAT TIME OF THE YEAR WHEN I SHOULD BE BRAGGING ABOUT THE ARIZONA WEATHER. I’VE GONE TO EXTREME MEASURES OVER THE LAST DOZEN YEARS TO STAY FAR FAR AWAY FROM ANY SNOW. LAST SUNDAY ON OUR TOUR OF RED ROCK CANYON WE ALMOST GOT A LITTLE TOO CLOSE TO THE SPRING MOUNTAINS AND SNOW. CHECKOUT THOSE SNOW SQUALS IN THE BACKGROUND. WHO WOULD OF THOUGHT A FLATLANDER FROM IOWA WOULD GROW TO LOVE THE MOUNTAINS AND SNOW OF ALL THINGS? THIS WEEK-END WE WERE OFF TO LAS VEGAS IN SEARCH OF RED ROCK CANYON. THE CANYON IS A FEDERAL CONSERVATION AREA, AND THEY HONORED MY LIFE TIME NATIONAL PARK PASS TO SAVE US THE $7 ENTRY FEE. THE CANYON INCLUDES A 13 MILE SENIC DRIVE AND LOT’S OF HIKING OPPORTUNITIES. IF YOU LOOK AT THE PICTURE ABOVE IN ABOUT THE MIDDLE, WHERE THE SAGE BRUSH TURNS TO ROCK, YOU’LL SEE FIVE LITTLE DOTS, THESE ARE PEOPLE HIKING. THE AREA IS PRETTY, AND BEING A SUNDAY WAS CROWDED WITH HIKERS, BIKERS, AND MOTORIST. OF COURSE A TRIP TO VEGAS INCLUDES A NIGHT ON FREMONT STREET. ABOVE YOU CAN SEE IT’S THE CHINESE NEW YEAR OF THE SNAKE. THE D CASINO AND RESORT WHERE WE USUALLY STAY HAS A NEW LATE SHOW. THE SHOW RECENTLY MOVED DOWNTOWN FROM THE HOOTERS CASINO OUT ON THE STRIP. HERE’S THEIR OLD AD FROM HOOTERS. OF COURSE I LIKED THE BLOND THE BEST …..
NOT MUCH GOING ON AROUND HERE. THE WEATHER IS WARMING UP AND 70 DEGREE DAYS ARE WELCOME. THE SCOOTER IS STILL IN THE SHOP, SO NO NEW SCOOTER ADVENTURES. ON OUR DAYS OFF WE RAN UP TO LAUGHLIN AND WALKED THROUGH FIVE CASINOS, HAD A COUPLE OF BEERS, AND DIDN'T LOSE ANY MONEY. WHEN WE GOT HOME IT WAS SUPER BOWL GAME TIME, AND NOW THE FOOTBALL SEASON IS REALLY OVER. MONDAY I REARRANGED THINGS IN THE SHED AND ENJOYED ANOTHER SUNNY DAY. UP COMING ON THE AGENDA IS A TRIP TO VEGAS INCLUDING A "WALK ABOUT" AT RED ROCK CANYON, AND SPRING BREAK IS COMING UP IN MARCH!